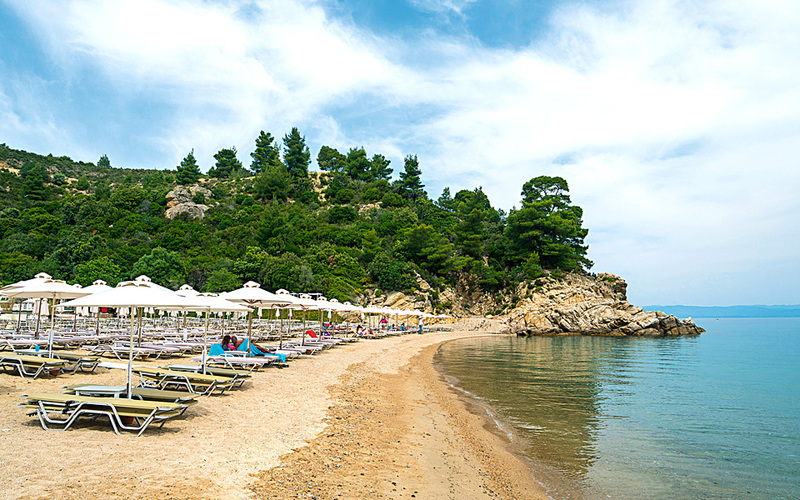 Relaxing on the beach of Akti Oneirou, on Sithonia's eastern coast. 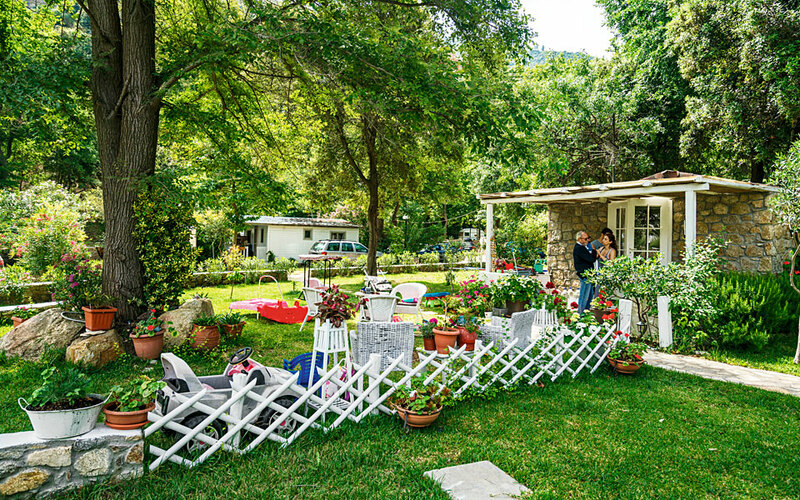 A Greek lawyer and his German wife made the first move in the ‘60s by launching Mylos Camping in Nikiti, the main town of the Sithonia peninsula. At the time, the venture’s official business name was “Holiday Center for Foreigners”, suggesting just how new a concept camping was for locals. 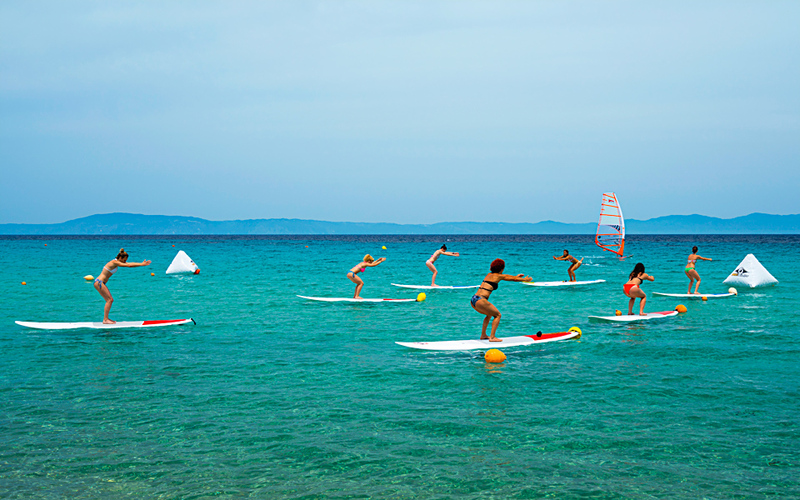 Over the next two decades, more campgrounds opened in the middle leg of Halkidiki’s three peninsulas. The establishment of Sithonia as a camping destination was helped by the fact that the area’s natural environment remained largely pristine, unlike the Kassandra peninsula to the west, which was slightly closer to Thessaloniki and had already experienced rapid development. Today, 26 of Halkidiki’s 38 camping facilities are located in Sithonia. The majority of them are friendly family-run businesses. Do not expect, however, to see rows of tents pitched side by side. Instead, most are filledf with trailers with LCD television sets and terraces topped with pergolas; mobile homes equipped with bedrooms, dining spaces, kitchens, bathrooms and air conditioning systems; or RVs with attachable awnings and gas barbecues. Tents, in fact, seem to be the least popular of all camping options. 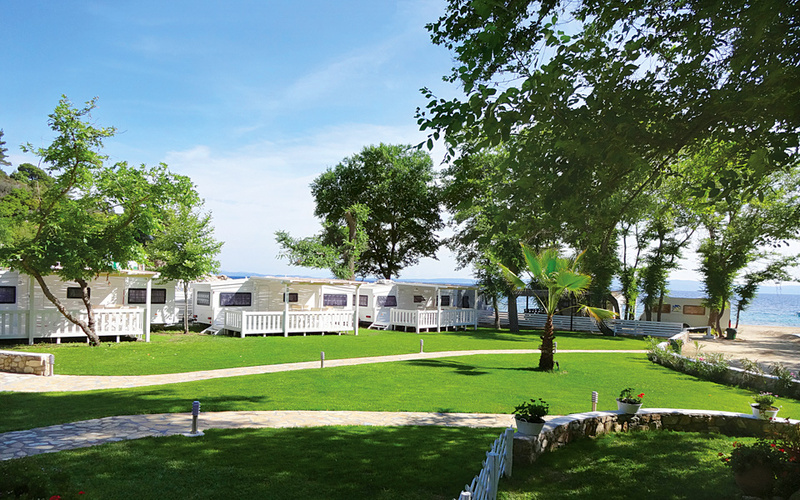 Luxury camping and bungalows at Akti Oneirou (Dream Coast), right by the beach. Akti Oneirou has been around for about a decade and offers different types of accommodation to suit all tastes. 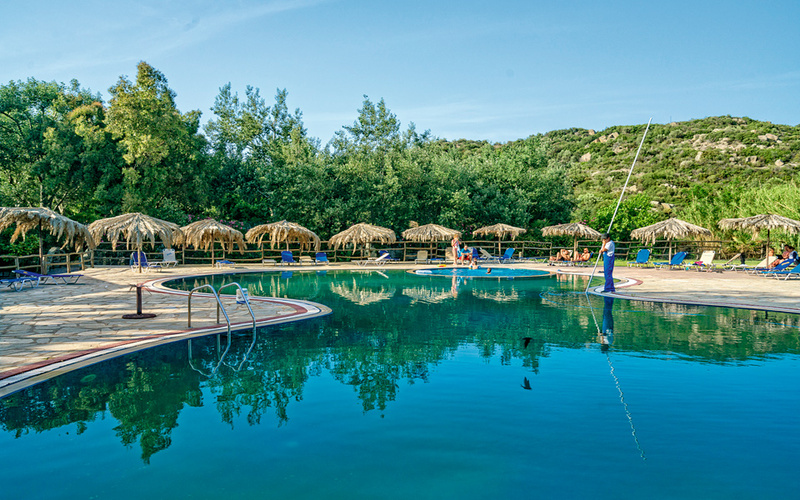 The campsite of Akti Oneirou is ideal for families with small children. Our tour of Halkidiki’s campgrounds began at the east side of the Sithonia peninsula, 12k beyond Vourvourou, on the road headed towards Sarti. Akti Oneirou (meaning ‘Dream Coast’), a luxury campground, is located here. Spotlessly clean and very well-appointed, it began operating about ten years ago. No trailer? No problem. Newly renovated bungalows are on offer here as well. Taking a walk by the coast, we happened to meet Pavlos. His daughter, still wet from the sea, showed us back to their campsite, where his wife invited us to take a look inside their family trailer. It contained a double bed for the parents, bunk beds for the children, a toilet and a shower; everything they needed. Pavlos, his family and a group of friends all arrived at the camping facility in late spring, occupying four trailers in total, and set up their little neighborhood. The group plans to decorate its little block with flowerpots and little lanterns and travel to the spot from Thessaloniki, the home base for all members, every weekend throughout the summer. After all, the facility is only 131 km south of the city, a two-hour drive. So, whether it’s been a good, a bad or a horrible week in the city, come Friday night, this group of friends will be relaxing at their seaside spot right through September. Five kilometers south of Akti Oneirou, Armenistis is one of the area’s best-known and oldest camping spots, launched in the 80s. The environment here is different. The facilities are simpler, and we found the overall atmosphere to be noisier and busier. By the sea, beach racketball games were in full swing and SUP yogilates lessons (a combination of stand-up paddling, yoga and pilates) were taking place out on the water. Antonis Stabolidis, now manager at Armenistis camping facility, began working at campgrounds in 1986. “At the time, my role was trivial. I was just the supermarket boy putting things in bags,” he remarked, before elaborating on the origins of this particular camping facility. Kalamitsi rents caravans and mobile homes, and also has a beautiful swimming pool. During its early years, the Armenistis camping facility drew most of its campers from central Europe – Austrians and Germans who drove to the area with surfboards on their roof racks. In the early 90s, the war that broke out in the former Yugoslavia blocked European road access to Armenistis. Business was severely affected, prompting the Armenistis team to invest in culture. Festivals and concerts were organized. Nowadays, the camping facility offers an open-air cinema and hosts many sporting and cultural events, including a Swing ‘n’ Swim international festival, featuring dancers from different parts of the world. We made our third and final stop at Thalatta, a camping facility in Kalamitsi, located in the southern part of the peninsula, 32k from Armenistis Beach. As the sun set, we wandered among small wooden bungalows and white motorhomes. The rows of little houses gave us the impression that we were somewhere in the south of the US. Their shady terraces and striped canopies prompted images of hot dogs and cold beer. This is a well-organized campground with excellent facilities, and the staff at the entrance were very friendly. As we traveled the peninsula, we realized that Sithonia and organized camping make a good match. If you enjoy this type of vacation, being close to nature and near to the beach in areas surrounded by trees, Halkidiki’s second “leg” may well offer the perfect spot for your best-ever camping experience. A historic landmark on Thessaloniki's waterfront.